When I look back on my trip to Tonsai, Thailand, I smile remembering the good times, then I feel a funny twinge in my stomach. It was a trip of a lifetime, despite a 24 hour bout of the infamous ‘Tonsai Tummy’ aka travellers’ diarrhea. Let’s just say that my intestines took a beating, making for one hilarious “type two” fun (the kind of story that’s horrendous at the time, but funny to recount later). Go ahead and laugh (or cringe) at my travel food poisoning, and try these tips! 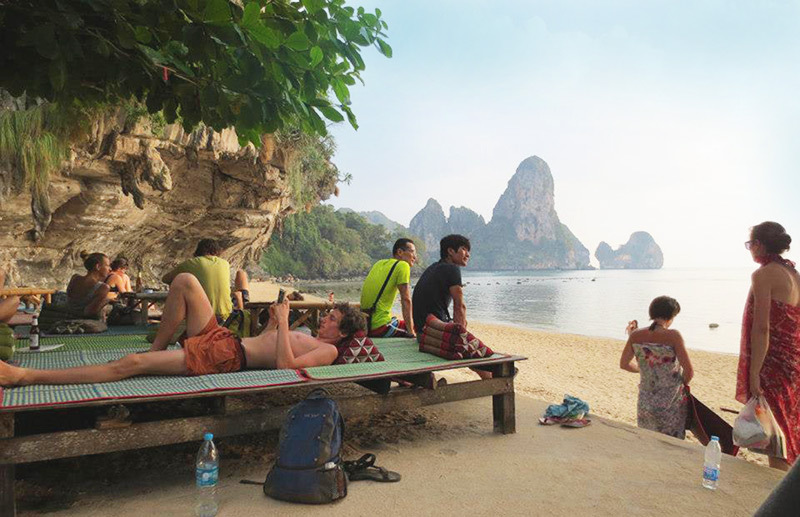 The Thai peninsula, Railay Beach, is world famous for beach lovers and rock climbers alike, but boy oh boy does it have infrastructure and sanitation issues! When I was there, it didn’t matter if you stayed in a 5 star resort with pool, or the dingy bungalow on the hill. No matter where or what you ate, or how clean you tried to stay, almost everyone fell victim to the rumbling, explosive, raging belly-demon, that infamous, nomadic, unwanted guest known as travellers’ diarrhea. It’s a funny travel story now, but there’s nothing quite like tag-teaming it in the bathroom with your bungalow roommate. Talk about getting to know someone—fast! I was pretty lucky: Tonsai Tummy only hit me for 12 hours, and less severely than my roommate, who had to make a run for the bathroom mid meal! I had taken Dukoral, which might have helped. In a nutshell, I spent most of an evening and an entire night moaning in bed with aches and chills, running to the bathroom, and forcing myself to consume liquids to prevent dehydration. The next day, I was weak, but pretty much back to normal. Needless to say, I was glad it didn’t hit me while I was on a climb, like some of the others I met on that trip! Every night for the rest of my stay, the raucous night calls of the jungle were punctuated with the sounds of my neighbours’ distress. From every bungalow on the hill below us, you could hear the belly-demon’s revenge! 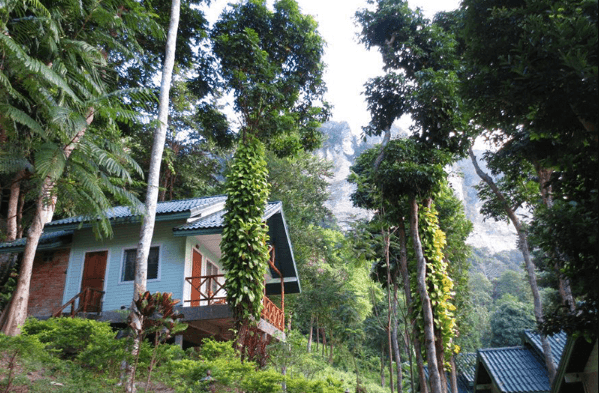 Thai bungalows on the hill: the jungle truly ‘comes alive’ at night! Travellers’ diarrhea isn’t limited to Southeast Asia, of course. You can get it anywhere. Gastrointestinal illnesses are common on cruises, for example, where close quarters make it easy to spread germs, despite the cleanest of crews. I remember the ghoulish hue of a woman on the last day of our Mexican cruise as she emerged from her stateroom for the first time. The poor thing was determined to have a good time, despite spending the first four days in the bathroom! If you’re curious about your cruise liner, you can always read up on the types of tummy trouble specific ships have encountered, like the norovirus, on the CDC’s website. Bring along active charcoal, and take it if you start feeling the ‘gurgle’. Antacids are good. Pepto Bismol seems to be popular with some (but doesn’t work for me). Buy bottled water, and if you are in a remote area, boil or treat it too. Those street kiosks with smoothies and shakes look appealing, but question the ice’s cleanliness. My technique: watch if others reacted to a beverage before trying a drink myself wasn’t necessarily fool proof! You might want to take Dukoral. It can lower your chance of travellers’ diarrhea by 25%. It’s not covered by provincial or travel insurance, but it might be worth it if you tend to have a sensitive system, or if your children do. You usually have to pay a fee for a doctor’s consultation (travel clinics are usually not covered in your provincial health plan). Most of all, remember that if you’re covered by good travel medical insurance, your visit to the doctor and medications will be covered. It would be a shame not to eat adventurously on your next trip! Travel Insurance for Cruise Holidays—Don’t Set Sail Without It! Good tummy luck to you, and happy travels! Join our Taste for Travel Contest Share a photo of a local delicacy from your travels abroad for a chance to win weekly prizes or $1,500 towards your next trip! Whether it’s balut from the Philippines, haggis from Scotland, or cuy from Peru, #EatAdventurously knowing you’re protected with travel insurance.